Monteggia fracture-dislocations are classified by the Bado system. Bado type I injuries are characterized by a proximal ulnar fracture with anterior dislocation of the radial head. This is due to a forceful pronation injury of the forearm and is the most common type. Bado type II injuries are "reversed" Monteggia fracture-dislocation injuries. Here, there is posterior angulation of the ulnar fracture site and posterior dislocation of the radial head. Bade type III and IV injuries are rare. 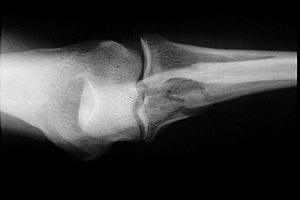 A AP radiograph of the elbow. This shows a comminuted fracture of the proximal ulna. B Lateral radiograph of the elbow. This demonstrates posterior dislocation of the radial head, a "reversed" Monteggia injury (Bado type II).